We are specialists in heraldry, coats of arms and family crests: English heraldry, French heraldry, Spanish heraldry, Italian heraldry, Russian heraldry, German heraldry, Polish heraldry, Portuguese heraldry, European and American heraldry. Coats of arms, crests, heraldry from all the world. 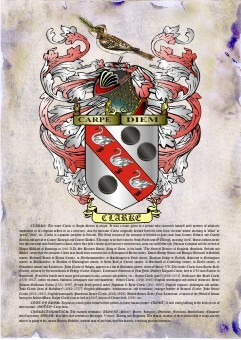 Heraldry & Crests offers you a lot of ways to obtain the coat of arms (blazon) and crest for your family name. We also sell heraldry books on DVD/CD-ROM. Graphic file Vectorial or Bitmap we send for e-mail. US $16 (or less) in graphic file JPG and US $22 (or less) in vectorial. Request it. 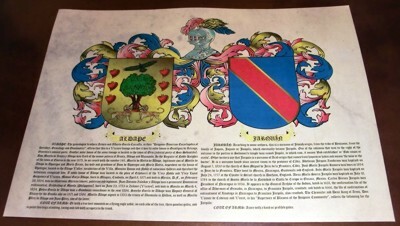 We have the Rietstap Armorial General (The Armorial General is the most authoritative work about the coats of arms in the world. The descriptions of the arms cover those of more than 213,000 families). 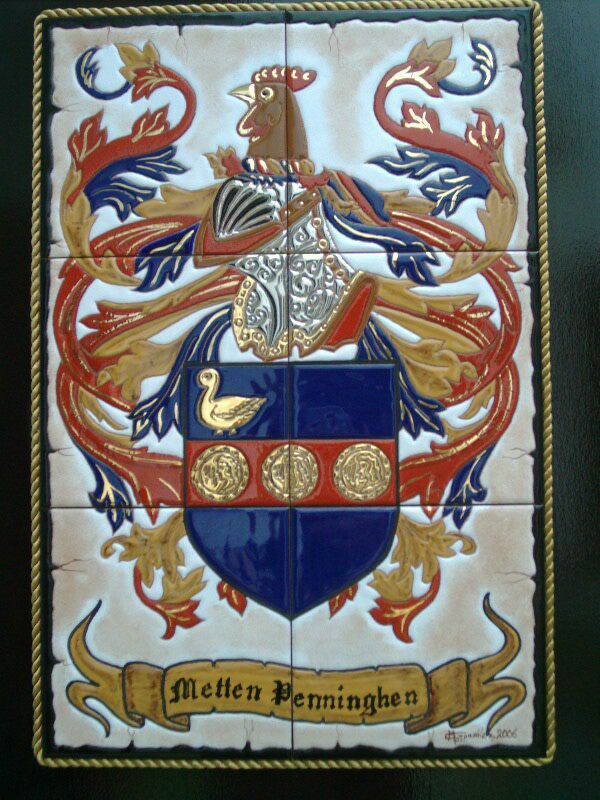 The best in heraldry and blazons. Our databases are in constant growth process, if your family name isn't here, you could consult us. We are working for more books of heraldry free with beautiful blazons, family crests and coats of arms. It's necessary adding the price of shipping: A4 and A3 -> US $8, A2 ->US$15 . 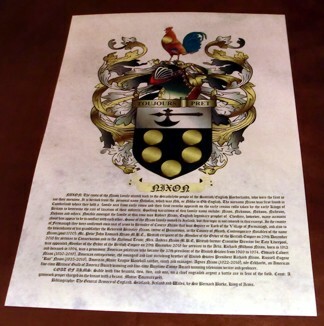 Double coat of arms in Old Parchment US $24 / DINA3 for US $46 / GIANT DINA2 for US $66. DINA4 = 8,3 x 11,7 inches = 21 x 29,7 centimeters. DINA2 = 16,53 x 23,38 inches = 42 x5 9,4 centimeters. With the sizes A3 and A2 we gift you the graphic file JPG sending by e-mail. With the double A2 we gift the 2 coats of arms singles and the double. DINA3 US $35 / DINA2 US $57. With the sizes A3 and A2 of Burnt Parchment we gift you the graphic file JPG sending by e-mail. With the double A3 and A2 we gift the 2 coats of arms singles and the double. The coats of arms are drawn by heraldic artists and not generated by computer software. The histories of the last names and the information of the coat of arms and heraldries are gathered of our varied heraldic bibliography, as well as in information of parochial and genealogical registrations. We want to leave perseverance that this is a serious, contrasted work and professional, to your service. FROM ONLY US $16 the graphic file JPG!! take a look! For only 20 euros we have it in vectorial format Corel-Draw that is THE BEST POSSIBLE QUALITY OF GRAPHICS, because you can resize without loss of quality, and is always adjusted for a good result in your printer. You must have the program Corel-Draw. Also in Windows Metafile and other vectorial formats as EPS, etc. 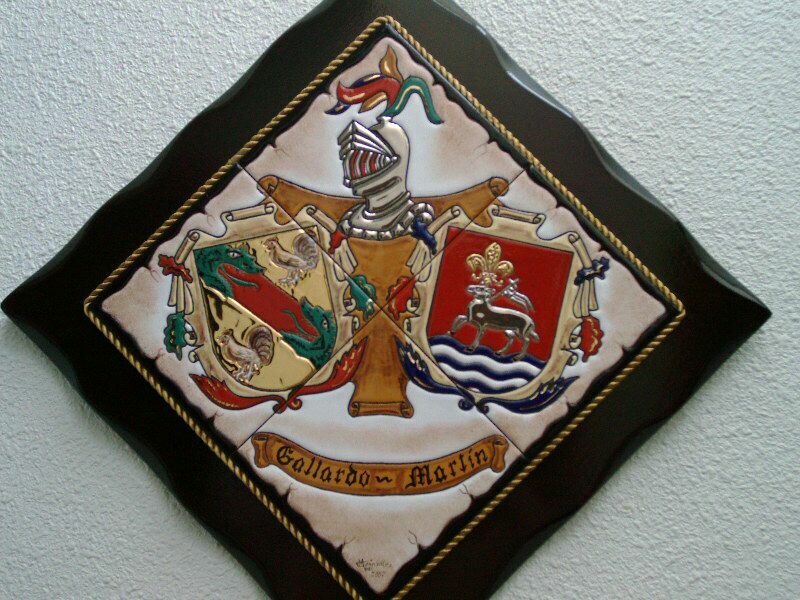 Heraldry shield in ceramic manufactured handmadely according to the technique of the dry rope. TECHNIQUE AND MATERIAL: Built in ceramic by means of the technique of "the Rope-dry" (relief), in a handmade total way. Decoration with Gold and ceramic Silver. Elegant ceramic that is not ruined with the weather, neither exposed to the bleakness. MEASURES OF THE CERAMIC: 17.7 inches (45 cms) of high x 11,81 (30 cms) of wide. 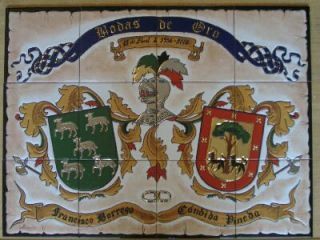 FREE gift the coat of arms in JPG. PRICE: US $240 included shipping !! MEASURES OF THE CERAMIC: 21.65 inches (55 cms) of high x 27.56 (70 cms) of wide. 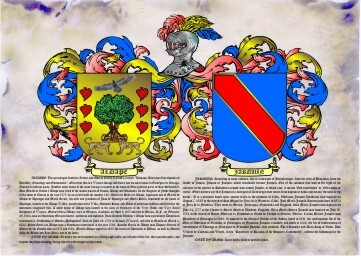 FREE gift the double coat of arms in JPG. PRICE: US $330 included shipping !! MEASURES OF THE CERAMIC: 11.81 x 11.81 inches (30 x 30 cms). PRICE: US $200 included shipping !! 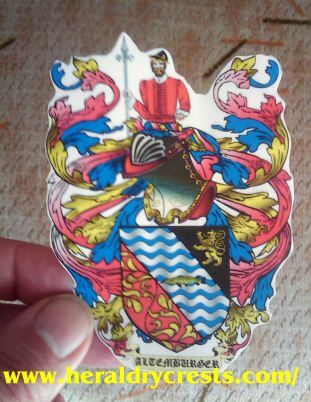 Your coat of arms and family crest in a water-resistant STICKER and and its history in other document. Or stickers of what you want, personalized. The name histories and the information of the coats of arms and heraldries are gathered of our varied heraldic bibliography as well as in information of parochial and genealogical records. This is a serious, contrasted and professional work of heraldry to your service. We don't use software of heraldry. Consult the whole catalog of heraldry, coats of arms and crests with our incredible prices. What is a Crest in heraldry? The word crest is often mistakenly applied to a coat of arms. 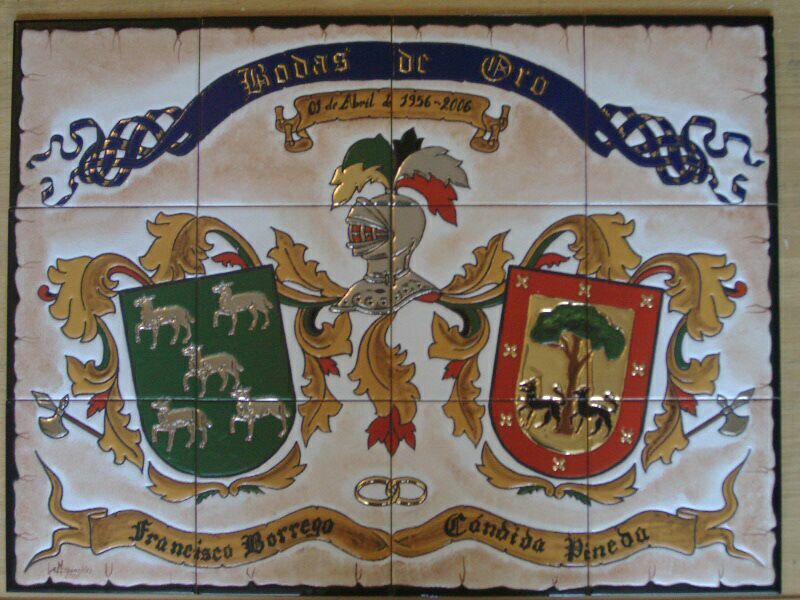 A dragon is the crest of Valencia's coat of arms (It was the arms of king Peter IV of Aragon). A crest is a component of an heraldic display, so called because it stands on top of a helmet, as the crest of a jay stands on the bird's head. The earliest heraldic crests were apparently painted on metal fans, and usually repeated the coat of arms painted on the shield. Later they were sculpted of leather and other materials. A crest normally stands within a wreath of cloth, called a torse, in the principal colors of the shield (the liveries). Various kinds of coronet may take the place of the torse. The most frequent crest-coronet in heraldry is a simplified form of a ducal coronet, with four leaves rather than eight. Towns often have a mural crown, i.e. a coronet in the form of embattled stone walls. Objects frequently borne in heraldry as crests include animals, especially lions, normally showing only the fore half; human figures, likewise often from the waist up; hands or arms holding weapons; bird's wings. In Germany and nearby countries, the crest often repeats the liveries in the form of a tall hat, a fan of plumes in alternating colors, or a pair of curving horns. The horns may have a hole in the tip to hold a cluster of plumes or flowers, and because of this have been imported to English heraldry at least once as elephant's trunks. Crests in heraldry are not normally borne by women or clergy, because they do not participate in war or tournaments and thus would not have a helm on which to wear it. An exception is the reigning queens of England or Britain, whose armorial display is indistinguishable from that of kings. Spanish * Learn Heraldica in Spanish.